PRISMs to Power the UK. 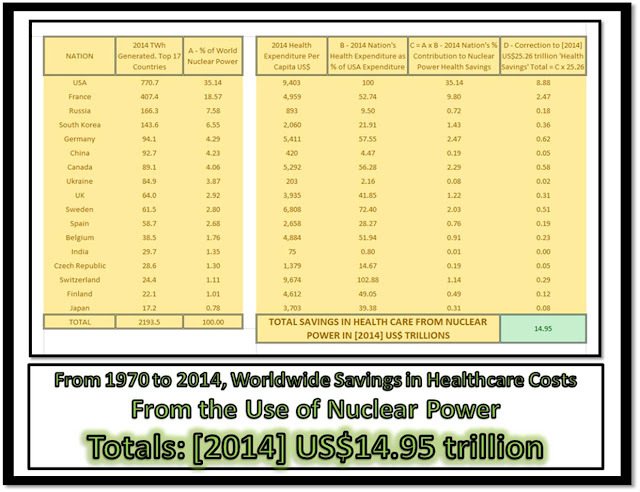 : Cost of Nuclear Power Accidents - versus - Savings in Cost of Healthcare from Nuclear Power Use. 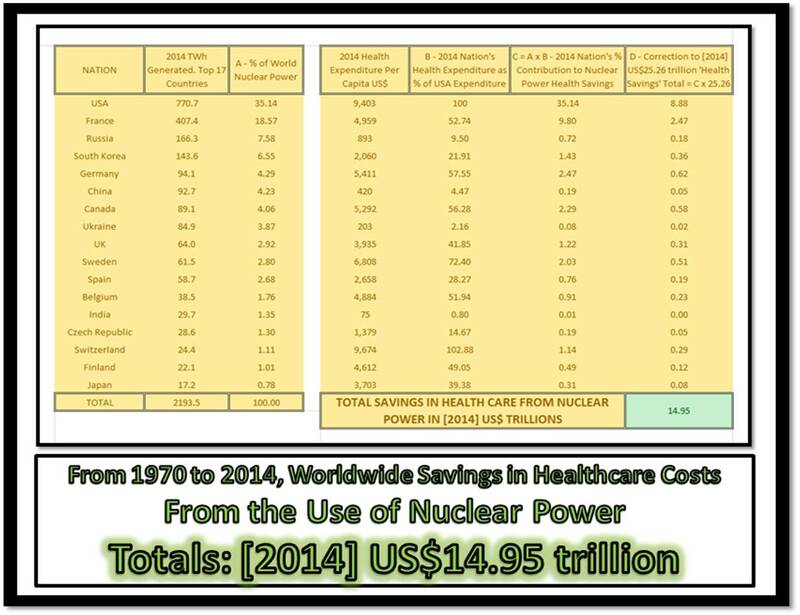 Cost of Nuclear Power Accidents - versus - Savings in Cost of Healthcare from Nuclear Power Use. For Belarus, there is a 15 national estimate of $235B for 1986-2015 attributed to “aggregate damage” and for Ukraine, there is a 25-year estimate for “total economic loss” of $198B. Scaled to 30 years, the Ukraine estimate of around $240B is quite comparable to that for Belarus. In our 2013 report, we identified a population of 10,000,000 as “exposed” in a relatively broad sense to radiation and the disaster, approximately one-third each from Russia, Ukraine, and Belarus. Thus, tripling either the Ukraine or Belarus 30-year estimates to cover the full exposed population leads to a total of around $700B in costs for the 30 years, assuming the same cost figures apply to Russia. This estimate involves a number of assumptions and must be considered as uncertain, but it is based on governmental figures. However, regardless of the inherent uncertainty the figure is high and existing estimates would support overall costs of hundreds of billions. The Financial Costs of the Chernobyl Nuclear Power Plant Disaster: Page 15. TOKYO (Reuters) - Japan’s government on Friday nearly doubled its projections for costs related to the Fukushima nuclear disaster to 21.5 trillion yen ($188 billion), increasing pressure on Tokyo Electric Power (Tepco) to step up reform and improve its performance. Cost of Nuclear Accidents in France, Germany, India, UK and USA [Including TMI] =  US$9,753 million. Note: Japan and South Korea accidents are not costed. Add in, Say: US$1,000 million = US$10,753 million. 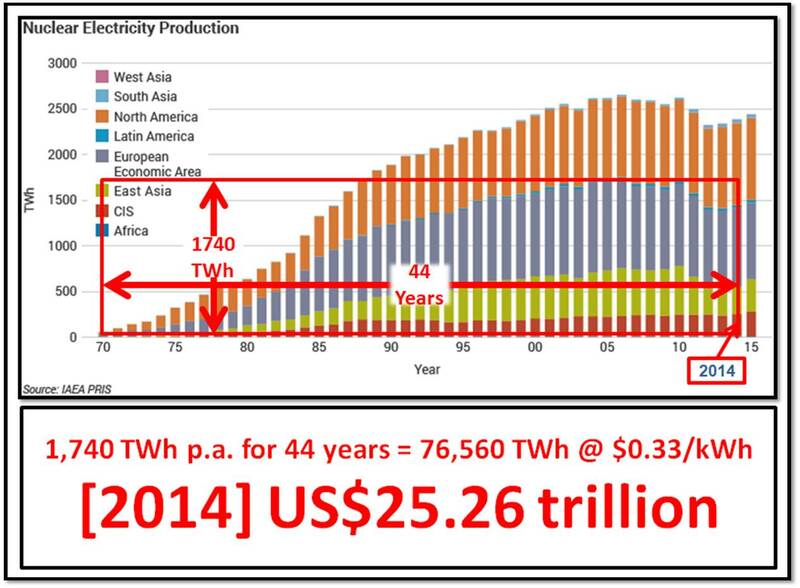 But the USA did not burn all of the coal to generate 76,560 TWh of electricity – and US healthcare costs are much higher than most other nations. I don't think it's fair to include Chernobyl, as it is completely non-applicable to any objective discussion of the merits and safety of modern nuclear power (or nuclear power anywhere outside the Soviet Union). Also, the $350 billion estimate for Fukushima is too high. Even the $100-200 billion estimated costs are mainly due to unjustified over-reactions, which is very frustrating. The case for nuclear is stronger than that shown. The ratio of economic costs is more like several hundred to one, and the ratio of lives lost is on the order of 100,000 to one (10 million for fossil, ~100 for non-Soviet nuclear). All of the meltdown cleanup extortion/punishment fee is due to LNT fraud. There should be ZERO CLEANUP, ZERO EVACUATION. Restart all plants immediately, DO NOT UPGRADE. Even a Fukushima-class meltdown is no problem because anything <100mSv/year has no impact on health. Reduce the cost of building nuke by 20x by eradicating the safety appeasement garbage. Fire all the regulators. There can, will, and MUST be more meltdowns for a legitimate expansion. 100,000 nuclear plants yes please, NBD if several hundred melt down. The radiation is less damaging than natural gas frack carcinogen and combustion. Need to rip up the nuclear industry and make it known that even an RBMK nuke is absolutely superior to combustion. I really admire the phrase "safety appeasement garbage". On the other hand, if MSR and even IFR technologies were the only ones used, I believe there would be NO meltdowns. Minor fires, perhaps, other small problems for the media to exaggerate, maybe even some minuscule inventory lapses of plutonium (AAARGH!) but nothing like 130 million tons a year of chemically toxic solid ash alone, in the USA. Anyone using Chernobyl as an example of nuclear-power cost or danger is uninformed or worse. Might as well argue to ban chemistry because one can make VX with it. Chernobyl was and is illegal outside the old USSR. Using it in any way against nuclear power is to destroy one''s own argument and respect for facts.